Rising oceanic and atmospheric oxygen levels through time have been crucial to enhanced habitability of surface Earth environments. Few redox proxies can track secular variations in dissolved oxygen concentrations ([O2]) around threshold levels for metazoan survival in the upper ocean. We present an extensive compilation of iodine to calcium ratios (I/Ca) in marine carbonates. Our record supports a major rise in atmospheric pO2at ~400 million years ago (Ma), and reveals a step-change in the oxygenation of the upper ocean to relatively sustainable near-modern conditions at ~200 Ma. 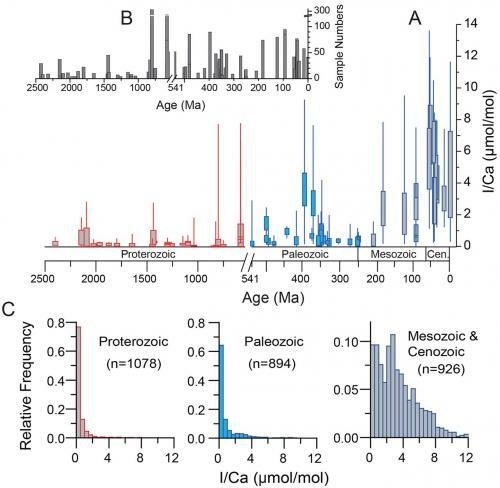 An Earth system model demonstrates that a shift in organic matter remineralization to greater depths, which may have been due to increasing size and biomineralization of eukaryotic plankton, likely drove the I/Ca signals at ~200 Ma.